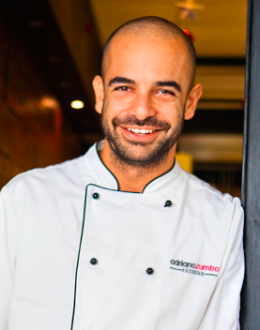 Adriano Zumbo (born in 1981) is one of Australian’s most celebrated pâtissiers. Born in the central plains of New South Wales and self-made in the city, Adriano’s swiftly expanding empire began in 2007 with his Balmain shop front, where sugared-up locals couldn’t get enough of pastries. An appearance on the first series of Australian MasterChef helped introduce croquembouche to an even wider audience and made Adriano – and macarons – a household name. Zumbo is also known for introducing MasterChef contestants to his technically challenging desserts. Zumbo’s creations are unique in their names, the technique with which he creates them, and the incorporation of unusual ingredients, such as black olive and beetroot. It’s Adriano’s love affair with confectionery, combined with his Parisian training at institutions that include l’Ecole Lenôtre and Pierre Hermé that has resulted in a sensibility as delicious as it is irreverent. Constantly evolving and always considering his next move, cake, or idea, Adriano’s infectious energy keeps his fans on their toes. They love it that way, and so does he! Besides appearing as a guest judge on MasterChef and an observational documentary series, 2011 saw Zumbo release his first book, Zumbo Book. His goal is to ‘caramelise the nation’ and it certainly seems that he is well on his way.